NASA's Mars rover Curiosity has beamed home photos confirming that it recovered samples from deep within a Red Planet rock, cementing the robot's place in exploration history. The Curiosity rover drilled 2.5 inches (6.4 centimeters) into a Martian outcrop on Feb. 8, and today (Feb. 20) mission scientists first set eyes on images showing drill tailings sitting in Curiosity's scoop, waiting to be transferred to analytical instruments on the robot's body. The photos confirm that Curiosity has pulled off an historic achievement, scientists said. "This is the first time any robot, fixed or mobile, has drilled into a rock to collect a sample on Mars," Louise Jandura, sample system chief engineer for Curiosity at NASA's Jet Propulsion Laboratory (JPL) in Pasadena, Calif., told reporters today. Curiosity landed inside Mars' huge Gale Crater on the night of Aug. 5, kicking off a two-year prime mission to determine if the area has ever been capable of supporting microbial life. Along with its 10 science instruments and 17 cameras, Curiosity's hammering drill is considered key to this quest, for it allows scientists to peer deep into Martian rocks for evidence of past habitability — something no other Red Planet robot has been able to do. The arm-mounted drill "allows us to go beyond the surface layer of the rock, unlocking a kind of time capsule of evidence about the state of Mars going back three or four billion years," Jandura said. The first drilling location is an intriguing time capsule indeed, scientists say. Curiosity bored into part of an outcrop called "John Klein," which is shot through with light-colored mineral veins and other evidence of long-ago exposure to liquid water. "All of these features tell us that the rocks in this area have a really rich geological history, and they have the potential to give us information about multiple interactions between water and rock at this location," said JPL's Joel Hurowitz, sampling system scientist for Curiosity. Mission scientists will learn more about that history when the drilled sample is transferred to two of Curiosity's key instruments, CheMin (short for Chemistry and Mineralogy) and SAM (Sample Analysis at Mars). "That'll play out over the next few days here," said JPL's Daniel Limonadi, lead systems engineer for Curiosity's surface sampling and science system. 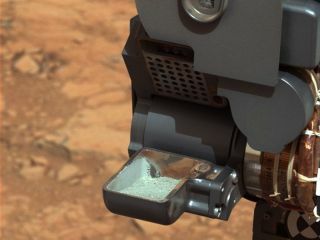 The recovered powder has already been used to clean out Curiosity's sample-handling system, to help ensure that the system is scrubbed free of potential contaminants from Earth. A minor software glitch has delayed the delivery of the sample to CheMin and SAM, but the team found a workaround, researchers said. The Curiosity team has also become aware of another potential issue with the the sample-handling hardware. Engineers built two models of this hardware to run tests here on Earth, and the sieve — which screens out particles more than 0.006 inches (150 microns) wide — has begun to detach on one of them. But this only happened after extensive use, and the sieve remained functional, rover team members said. And they stressed that there is no sign of any problem with the sample-handling gear Curiosity toted to Mars, though they'll take some measures to lessen the sieve's workload on the Red Planet (such as sieving samples for 20 minutes rather than 60 minutes, which Curiosity had done previously with soil samples). "Based on the test results to date, and based on how we expect to use the hardware on Mars, we really have pretty good confidence that we're going to be able to use this hardware through the prime mission and beyond," Limonadi said.